According to the 2009 Good Beer Guide, it was previously known as the Pickle Jar, but was refurbished and renamed in spring 2007; also, the food is all freshly prepared with a focus on local produce. The GBG also indicates there's a "beer club" on Wednesday evenings where real ales are reduced in price. Inside it becomes clear that the refurbishment has been sensitively done. There are polished wooden floors and tables of various sizes, muted decoration with plenty of old photos lining the walls, and shelves of books being sold for charity. One corner of the pub has tables laid out with cutlery, but the other half does not. The space is open and airy, but retains its character and is a pleasant and cosy environment for just a drink as much as for eating. There are four handpulls for ale on the bar, three of which were in use on our March 2009 visit, featuring Timothy Taylor Landlord (tasting perfectly fine), Spitfire and Vale Best Bitter. On Kake and Ewan's second visit, in May 2011, the ales were Tring Tea Kettle, Ringwood Best, Ushers 1824, and Timothy Taylor Landlord. A pint of lime and soda was £1.20. There was one other customer in when we arrived around 1pm, and music was playing (a Jamie Cullum CD), though not too loudly. There were still three ales on Ewan's 2015 visit, in the same kind of area (brown beers, including a bitter and a golden ale). Although it was a nice sunny day, there were only a handful of customers. As of May 2011, food is served noon-3pm and 6pm-9:30pm Monday to Saturday, and noon-4pm on Sundays. As of March 2009, the mains are all priced around £6-£7, with a good selection of starters and desserts as well photo of menu as of March 2009. A specials chalkboard lists a few additional dishes, such as a soup of the day. The menu itself sticks fairly closely to pub basics, without a great range of options for vegetarians (in March 2009, Ewan chose two smaller dishes over the only vegetarian main, a tomato & basil pasta), but what it does, it does well. In March 2009, Ewan's roasted butternut squash soup (£3) photo was a good size for the price and served with a chunk of baguette. Another light dish, the warm goat's cheese drizzled with honey on toasted French bread (£3.45) photo was simple but effective (even if the salad on the side was dry and unappealing). Kake was very pleased with her beef & ale stew (£7) photo. In May 2011, Kake's cauliflower and cheddar soup (£3.50) photo was fine, edging towards being too salty, but not quite there. The accompanying bread and butter did the job without being overly exciting. 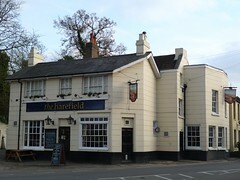 Note that according to a board outside, the Harefield is over 21s only. Accessibility: One shallow step to enter, and a ramp has been installed for getting to the toilets (they are one step up, behind the bar). Last visited by Ewan and friends, June 2015. Opening hours and food times taken from a board outside, May 2011. Last edited 2015-09-12 14:01:42 (version 17; diff). List all versions. Page last edited 2015-09-12 14:01:42 (version 17).